Just wanted to let you know that this chunky and delicious Instant Pot Meatless Easy Vegan Chili Recipe is sponsored by my plant-protein loving friends over at Gardein! 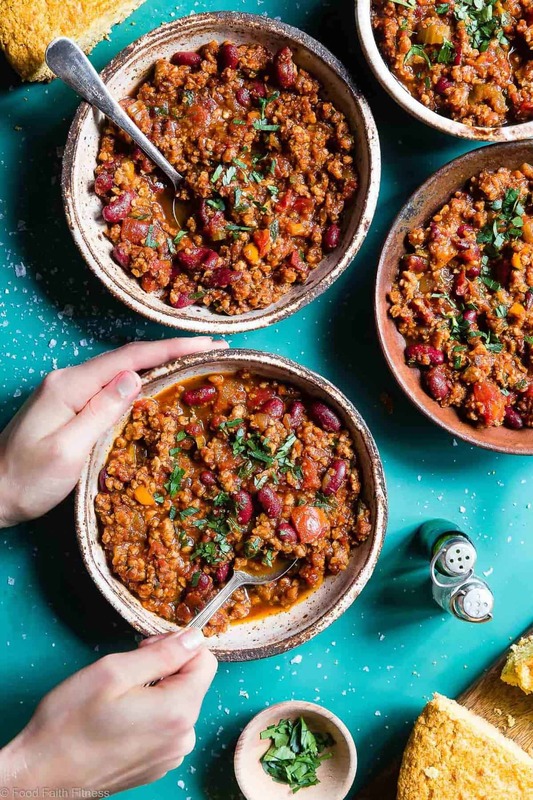 This Vegan Chili Recipe is a quick, delicious weeknight dinner that’s packed with plant-based protein! Even meat-eaters will love it! Oh hi, it’s me again. 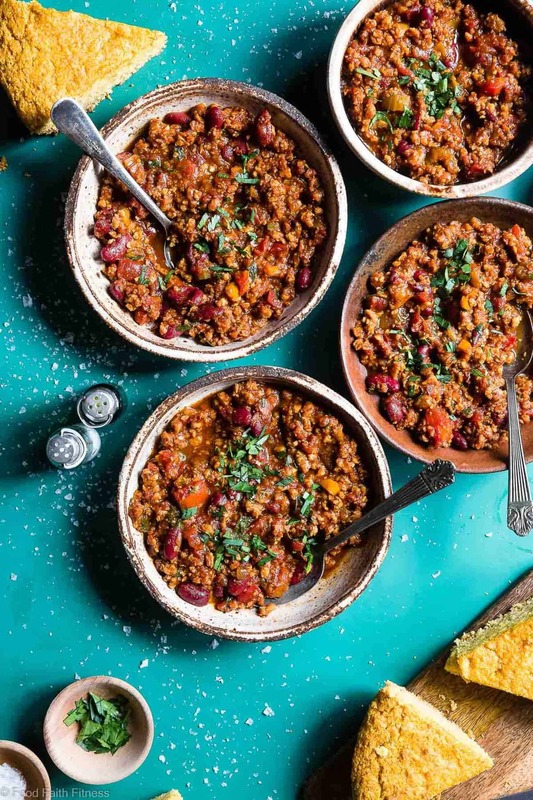 Your new best food friend instant pot chili. I just figured that you were a very important person who lives a VRY VRY busy-important-person kinda life, so you just might need another stupid-easy dinner recipe to whip out of your back pocket. I also thought that since the temperature has (finally!) 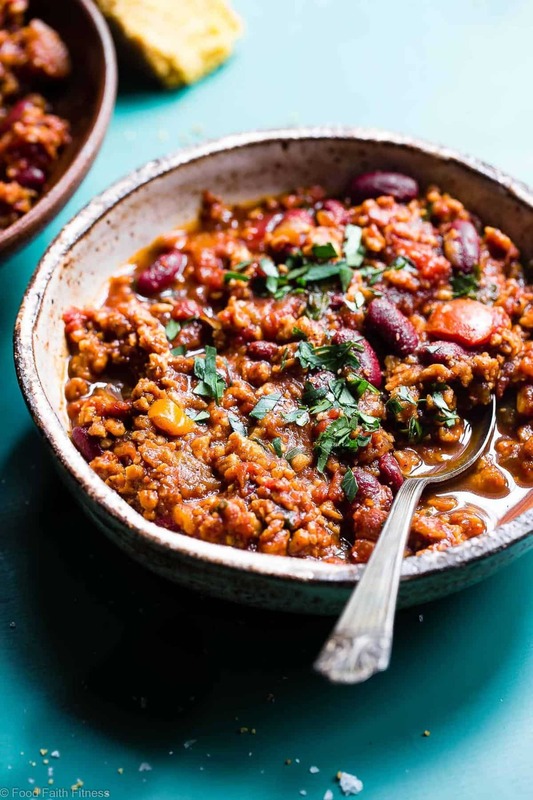 cooled down, you might be VERY into face-planting into yet another bowl of cozy, slurpy and THICK chili, swirling with spicy cumin, tender tomatoes and chewy beans. Wiiiiith a few other secret ingredients <–SUSPENSE. Okay, this is the real Taylor talking again. Not “Taylor-who-is-akwardly-trying-to-make-you-think-your-soon-to-be-dinner-is-talking-to-you Taylor.” Hi! Like awkward-chili-me just said, I know it’s only been a hot minute since we had keto chili but, YOU GUYS, this one has a TWIST. A SURPRISE. We’re giving one of my current favorite “go to” dinner recipes (because, HELLO, it’s so easy!) a little MEATLESS upgrade! This is a VEGETARIAN chili recipe. And, not to toot my own horn or anything, it’s the best vegan chili that you’re ever gonna taste, for REAL. Current life happenings are looking something like me going meat-free a lot more than usual. <– Nope, not just on Monday’s. Doin’ the meatless mambo a FEW times a week over here. Don’t get me wrong, I still have a carnivorous inner-soul, B-U-T I’ve been trying to balance it out with eating more vegetable friends. And, CONFESSION, I can tell a difference in how I feel. My tummy is happy, less bloat-y and it just FEELS good. I used Gardein (garden+protein=Gardein!) Beefless Ground as a super-sneaky ground beef switch and, you guys, it’s just so awesome. 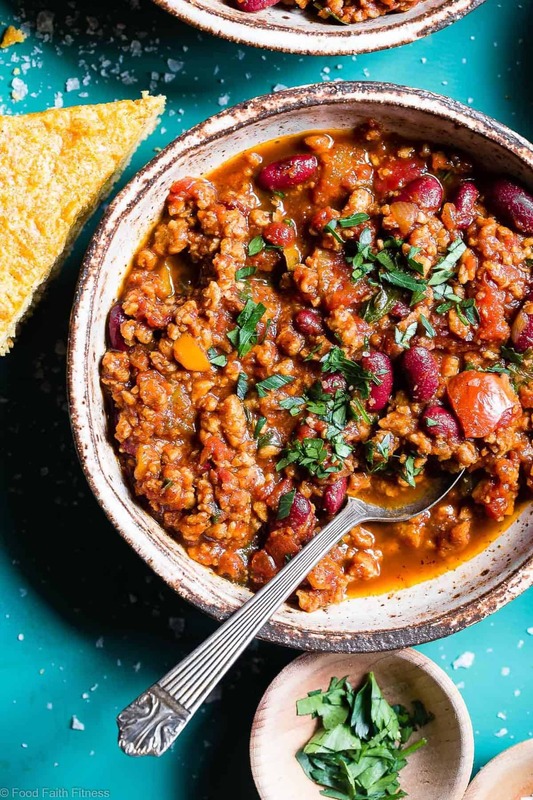 It’s perfectly crumbly and a little bit chunky, and has this texture that will make you flip your lid when you realize that – PSYCH – you are actually not eating the most meat-y, carnivore-y chili recipe. The fun part about Mr.FFF not being home during the week is that he isn’t around to see what I put into my recipes. I didn’t tell him about the vegetarian situation at hand and you know what? 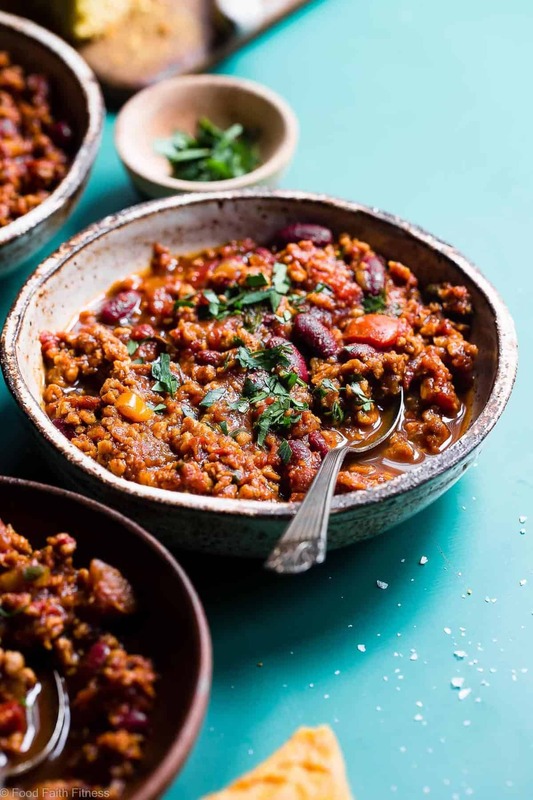 HE ATE 3 BOWLS of this Instant Pot meatless easy vegan chili recipe without even batting one of his (annoyingly long and perfect) eyelashes. If I had a dancing GIF, I would insert here right here. RIGHT NOW. Gardein has 30 delicious, vegan friendly and non-GMO products that are all made from wholesome soy, wheat and pea proteins, along with real-food veggies and ancient grains! 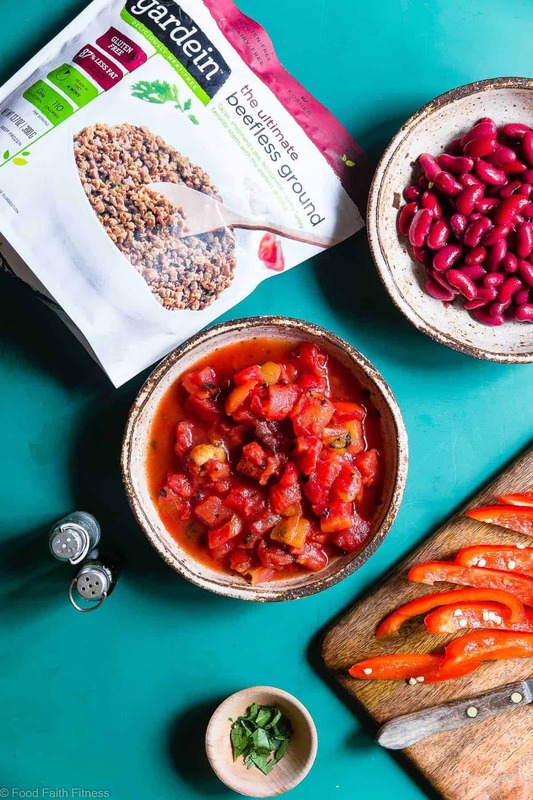 <– The beefless ground packs 18g of plant protein per serving! Also, check out that FIBER. Pump, pump, pump, PUMP IT UP. Slice your veggies and sauté them until they soften. Add in your spices and cook until nice and fragrant – your nose will KNOW when the time is right! Add in all your “liquid” ingredients like diced tomatoes (the fire roasted kind adds an ADDICTING smoky PUNCH) tomato sauce and tomato paste. THE SWITCH: Now you stir in your beefless ground until it’s warmed and you’re ready to get your slurp on. Serve it with a side of sweet vegan cornbread and you will 100% not be mad at all about your dinner-eating-life-decisions. 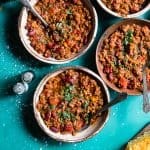 This Instant Pot Meatless Easy Vegan Chili Recipe is a quick, delicious weeknight dinner that's packed with plant-based protein! Even meat-eaters will love it! Pour the oil in your Instant Pot and turn it to sauté mode. Once hot, sauté the onion, pepper, celery and garlic until they begin to soften, about 3 minutes. Add in the chili powder, paprika, cumin, cayenne and Allspice and cook until fragrant, about 2 minutes. Add all the remaining ingredients, except the water, Beefless Ground, and parsley, and stir until well combined. Cover the Instant Pot (make sure it's set to sealing) and turn it to manual mode (it should immediately be set for high pressure) set it for 10 minutes. Once cooked, let it steam release naturally. Once the steam is released, remove the lid and turn it to sauté mode. Add in the water and Beefless Ground and cook for 3-4 minutes, stirring frequently, until the Beefless Ground is warm. Stir in the parsley and DEVOUR! THIS POST IS SPONSORED BY MY FRIENDS AT GARDEIN. THANK YOU FOR ALLOWING ME TO CONTINUE CREATING GREAT CONTENT FOR YOU BY SUPPORTING PARTNERSHIPS WITH SUPER-FAB BRANDS THAT FOOD FAITH FITNESS LOVES TO WORK WITH! AS ALWAYS, OPINIONS REMAIN 100% MY OWN! Every day I see a new recipe that makes me want an Instant Pot. I just have such a small kitchen I don’t know if I can add another appliance. This really sounds amazing though! And so easy! I LOVE mine! You gotta get one! It is finally cooling off here and raining for days!! So, this will be perfect! I am also trying to eat meatless a little more often! You have to try this then! Such a great flavorful version of chili! Looks great!! RARELY do I ever say that I’d wish _____ would sponsor me, but GODDAMN, I want Gardein to sponsor me! Aside from Halo Top, So Delicious, and Trader Joe’s, LOL! Anyhow, this looks like such a superb vegan chili that I’d try any day! I do wish that Gardein sold their beefless grounds in bulk so I could make a HUGE JUMBO batch of vegan recipes for the week! We love Gardein products. This chili looks fantastic! Perfect for these chilly fall nights! Aren’t they so good!? Thanks Jenn! I love how healthy this is and that it is made in the Insta Pot! Omg, this looks amazing Taylor! I am in such a chili mood recently so I’ll have to try this version! I hope that you love it Tori! It looks absolutely delicious! I still don’t have an IP, but recipes like this one make me lean towards one. You would love it! The IP is the best! Just made this – it was delicious! My husband is having seconds as I type. I would adjust the salt to about 1/2 tsp next time and maybe add more beans (black/pinto). I do love salt 🙂 But thanks! This chili is FANTASTIC! I’m a terrible cook and when I tasted this, I thought, “Finally! I got something right!” I didn’t have Gardein crumbles and wanted to keep it whole foods so I added a can of pinto beans and a can of black beans. When I had my boyfriend taste it, he said, “Give me a cup of that!” I made it for a holiday potluck and doubled the batch. I set the IP up at the potluck to heat and went off to help with other things. When I went to get my food, the chili was half gone! I excitedly told my boyfriend and someone at the next table said, “Compliments to the chef! The chili is great!” By the end of the night, only one small serving was left! This is definitely my new go-to for dinner parties – so easy and crowd-pleasing. Thank you for enabling me to feel proud and to celebrate a small victory! Yeah!!! I am so excited to hear this! Thank YOU for letting me know! Strange! It definitely could have been the tomatoes! Glad you liked it! We are making this for the first time tonight! But I have to ask- is the amount of sodium correct? 73% of your daily allowance in one serving? Is that from the Gardein? I would imagine! I do just use an online calculator so I can’t say it’s 100% accurate!